The best way to approach studying the Prophet’s life is through the lens of his character traits. In this work, Shaykh Yusuf al-Nabahani masterfully weaves the longstanding Shama’il tradition into an accessible read that combines both the erudition of a scholar and the love of a mystic. 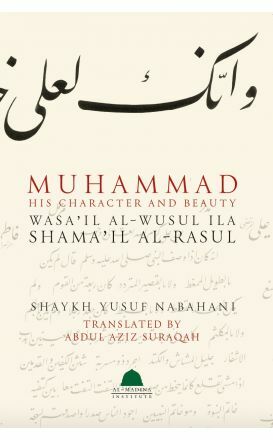 The auspicious arrival of this work in English is a blessing the magnitude of which cannot be expressed in words – and what a better a translator to present it than Sidi Abdul Aziz Suraqah. As a traditionally trained calligrapher I have the honor of writing the description of the Messenger Muhammad. Each time I pen his hilye I am overwhelmed with a renewed sense of love and appreciation for him. This work of Shaykh Yusuf al-Nabahani eloquently explores the persona of our Prophet and will engender all readers with a deeper love and admiration of him. Having authored many works centered around the Prophetic persona, Shaykh Yusuf al-Nabahani was known for his immense love and admiration of the Messenger. He once described himself in poetry as the “Servant of the Master of Prophets” yearning to be the Anas bin Malik of his time. His deeply rooted affection is felt in the work before you and serves as a springboard for seekers attempting to walk the path of loving the Messenger of Allah.